Mark Calaway is going to be just fine but The Undertaker is no more. Rather than mourn a death, let’s celebrate a legacy like no other. WrestleMania is best regarded as a collection of moments, snapshots of superstars that will last an eternity. Whilst the Cena proposal and the return of the Hardys were worthy entries into the canon of WWE history, no moment will linger in the mind longer than that which closed the night. After The Undertaker slowly laid his iconic hat and gloves on the mat, he kissed his wife at ringside before fading to black, bringing the curtain down on a legendary career. Rumours of one more match were quick to circulate but this really felt like Mark Calaway’s exit from the game, an old school ending for an old school performer. The match was unspectacular, at times sloppy, but sometimes star ratings and work-rate don’t really matter. This was history in the making, the Undertaker’s last stand, a passing of the torch, and it was the right way to call time on one of the greatest runs this business has ever known. It is no exaggeration to say that the Undertaker has been a near constant presence in my life, a supernatural extra that I could depend on to be a welcome distraction from the realities of school and later, career. Even before my parents signed up to Sky TV, enabling me to throw myself head-first into the world of the WWF, I already knew who Taker was. I saw his image in sticker books and magazines that my friends brought into primary school; I heard all about his haunting entrance and the whispered possibilities that he was really dead (#kayfabe); so enamoured was my brother with this fantastic character that he poured his pocket money into the purchase of the Hasbro figure, a big commitment for a kid who had never even watched a wrestling match at this point of his life. So when I finally got to watch the WWF in 1994 and saw the Undertaker wrestle for the first time, it was a big deal for me. And to be able to watch him for the entire 23 years of my wrestling fandom has been a real privilege. In terms of his legacy, he will be forever woven into the history of both the company and the sport: an icon that could not be defined by conventional metrics like box office and merchandise sales. In pure business terms, the Mount Rushmore of the WWF/E is Sammartino, Hogan, Austin, Rock and Cena. The Undertaker, like Andre the Giant, occupies a special sphere distinct from this group; if Bruno and company represent the Presidents and Popes of history, mighty men that hold positions of power and respect, Taker and Andre are more than mere men- they are Gods that command pure reverence. Their exploits are not road stories to be dished on a podcast; they are myths to be passed on to future generations. The high points of Taker’s legacy are obvious: his WrestleMania streak will forever be one of the greatest ongoing stories in company history; his match with Shawn Michaels in 2009 was, for my money, the best match ever witnessed in the WWF/E ; he will be forever synonymous with the Hell in a Cell (bouts with Michaels, Foley and Triple H were classics for wildly contrasting reasons); his entrance, from the ominous theme song to the slow, measured walk will never be surpassed in terms of atmosphere and spectacle. But there are other moments that deserve recognition, matches, feuds and angles that have been afforded less attention yet demand repeat viewing as we accept his retirement and celebrate what was, without cliche, a once in a lifetime career. Thank you Taker. Modern fans looking for Taker matches of old should scour the WWE Network for these forgotten beauties… a WWF title match with Bret Hart at SummerSlam 97 is firmly in the top 10 of both men’s careers and has a finish to die for. The heat seeps through the screen… In 2002, after a couple of rough years, Taker got his mojo back: his match with Lesnar at No Mercy 2002 is great, gimmicky fun, with blood aplenty. Even Heyman gets colour… In 2003, Taker had his only PPV match with John Cena at Vengeance: the bout is far from a classic but as it’s the only time we’ll ever see that combination, it has historic value… His World title match with Kurt Angle from No Way Out 2006 has to be seen to be believed… A last man standing match with The Big Show from Cyber Sunday 2008 generates an incredible amount of drama and is far more engaging than anyone would have thought possible. When debating Taker’s most iconic feuds, the names of Mick Foley, Shawn Michaels, Kane and Brock Lesnar are often raised. Surprisingly few fans instantly refer to the Deadman’s prolonged 1998/99 programme with "Stone Cold" Steve Austin: a conflict that is one of my own personal favourites. With Vince McMahon limiting his in-ring appearances, Taker was chosen to be the foil to Austin for large portions of the Attitude Era and their chemistry was fantastic as they told a tale based on whether the Rattlesnake could trust the possibly corrupt Phenom (spoiler: he couldn’t). This was one of the better drawing programmes of Taker’s career, with the SummerSlam 98 card that they headlined securing 700,000 PPV buys, making it the highest performing SummerSlam of all time. The story lost momentum and became convoluted with the formation of the Corporate Ministry (although that theme song was one hell of a mash up) but the culmination of a first blood match at Fully Loaded July 1999 was brutal, gory entertainment. Even legends have some moments that they would like to forget… It’s fair to say that the early years of the Undertaker didn’t throw up too many classics. Nothing was as bad as his 1993 brace of matches with Giant Gonzalez… well, at least until his 2006 feud with The Great Khali. Now admittedly, Khali’s selfie game is strong but he was such a limited performer that it’s astonishing that he wasn’t only booked to beat the Undertaker at Judgement Day- he was booked to absolutely squash him… His 1994 match with the imposter Undertaker at SummerSlam was an interesting idea but wasn’t executed brilliantly. 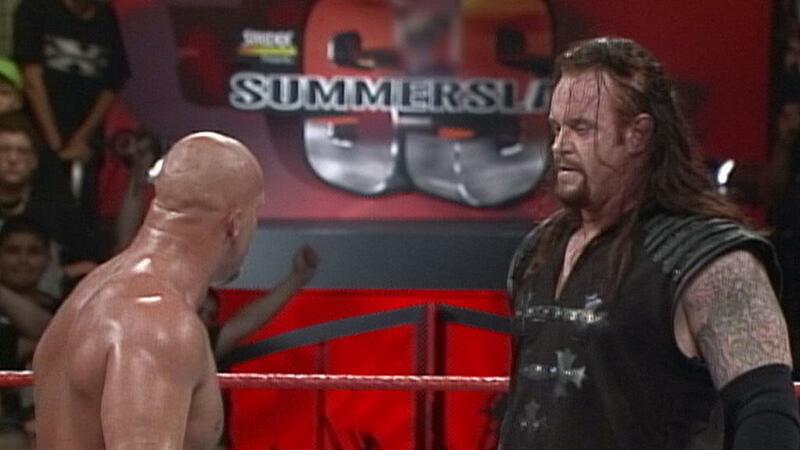 Even Leslie Neilson couldn’t save it…On an episode of RAW in the summer of 1999, Taker told a story about having dumped The Big Show in the desert a few days prior. Fortunately, Show still made TV, walking to the arena with brand new snake skin boots. This was weird…A feud with DDP could have been something but Taker gave the Hall of Famer absolutely nothing in their brief series… The Undertaker once forced Jim Ross’ face into Vince McMahon’s bare naked arse. No wonder he felt like he owed JR a gig at this year’s Mania!